Whether you live on rural acreage or a city lot, virtually anyone can grow a simple garden—regardless of your skill level and busy schedule. 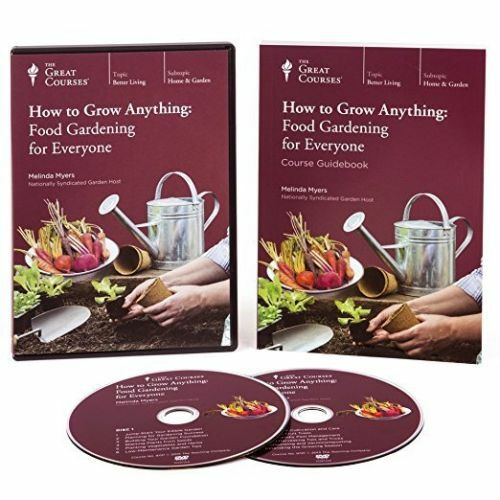 How to Grow Anything: Food Gardening for Everyone is a practical guide for cultivating fresh produce from seed to harvest. While starting a garden may sound intimidating to some, nearly everyone can grow a few herbs, fruits, or vegetables. And as gardening pros know, nothing beats the freshness of a crisp vegetable right off the vine, a sweet fruit plucked from the tree, or a savory herb from your window box. When you grow your own food, not only do you get the freshest produce and the most delicious flavor, you also get a lower grocery bill and the satisfaction of a job well done. Created by renowned horticulturalist Melinda Myers, these 12 lessons are full of tips and tricks for novice gardeners and green thumbs alike. You’ll discover how to repair damaged soil, convert grass to a garden, build raised beds, and prevent plant diseases through good watering habits and proper airflow. If you’re already a garden guru, you can still gain a wealth of knowledge about topics such as boosting the nutritional value of your growing space and eco-friendly methods for fighting pests such as hornworms, beetles, aphids, and other bugs that might munch on your fruits and veggies. Further, you’ll get insight into how to design a beautiful garden that will fit your space, so you can feed your eyes as well as your body with your handiwork.Covering everything from materials and preparation to maintenance and harvesting, this guide provides you with all the practical knowledge you need to grow fresh food right outside—or inside—your home.